Garage doors are designed not only to protect your car but your house as well. When the door fails to close properly, your home security can be compromised. Such problems occur for a variety of reasons, including opener malfunctions, loose tracks, and damaged springs. If the travel limit of your door is not properly adjusted, it won't close all the way. The door can get jammed if the rollers can't travel upwards or downwards because of dents in the tracks. In an attempt to help people deal with such important problems in a timely manner, our company offers emergency services. Security issues caused by malfunctioning doors are not the only reasons our team offers fast response garage door repair services. Many of these problems can also compromise the safety of your family. When the sensors are misaligned, broken or disconnected, the reverse system won't work. The door will shut down even if there is an object in its path. With the springs broken, the door could slide down and hit a person or a car. Such issues are extremely serious and must be handled by professional technicians as fast as possible. What makes an opener's sensors malfunction? Nowadays, garage door openers integrate safety sensors which will reverse the door before it comes in contact with an object or human. These sensors, also known as "photo eyes", are installed at the lower parts of the two sides of the door so that they can detect even small animals passing by. If the wires of the sensors accidentally get crossed, or a car bumps into one of the eyes, the reverse mechanism will fail to work properly. This is a dangerous situation. When you encounter something like this, contact our company as soon as possible. Our experts will quickly fix the problem. Our skilled technicians can assist every Tempe homeowner in a timely fashion. 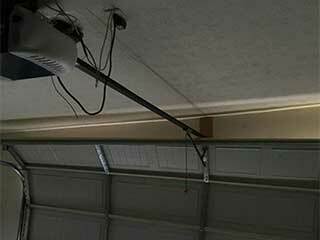 We are trained to repair garage door cables, adjust torsion and extension springs, fix the force and travel limit of the door, align the sensors, change the wires and repair the damaged tracks. When the safety of your family and the security of your house become compromised, you can trust our professional team to quickly take care of the problem. Damaged panels, tracks, sensors, rollers, and springs can all be fixed so that the door will open and close properly and you won't run the risk of an accident. Contact our Garage Door Repair Tempe team if you suspect there is an issue with your system's motor or its reverse system. Give us a call now!